Toy robots that teach kids how to code are, honestly, nothing new. But, on the CES 2018 show floor, we’ve met one coding toy robot to beat them all: the Root by Root Robotics and Coding & Play. The Root is unique in that, rather than simply teaching toddlers how to code through more easily-digestible reductions of what coding actually is and stopping there, increases in complexity as your kids grow in understanding. Root does this through a smartly-designed companion app that separates its coding concepts into three levels of understanding. Of course, it will be available on both iOS and Android. At just $199 (about £149, AU$259) when it launches in June 2018, that’s a pretty excellent value proposition for a toy that’s expected to be a part of your kid’s life for more than a decade. Before getting into the various levels in which Root operates, the entire basis of playing with Root is issuing commands for the Roomba-like robot to follow – go here, stop there, spin around – at varying levels of complexity. The robot executes these functions through a vast array of hardware. Two light sensors, four touch-sensitive surfaces, a color-sensing bar, magnetic surface sensors – so as to attach itself to white boards in the classroom or at home – and two drive wheels allow Root to carry out what you tell it to. At the first level, which Root Robotics calls ‘graphical programming,’ all of the functions that Root can carry out are represented in the app via easy-to-understand icons and buttons. Kids will likely start by testing out one function at a time, but can chain functions together a la ‘if-this-then-that’ with simple drag-and-drop controls as well. When kids reach the second level, Root expands its capabilities to understand more complex instructions, like ‘if-then-else’ statements that are achieved by turning those buttons and icons into puzzle pieces with more of the actual code written on them. These pieces fit between others to demonstrate how function paths work. Of course, the idea is that, by the time a kid reaches the third level with Root, they’ll be prepared to write code as any professional programmer would. They can even export their code for use in more advanced environments. 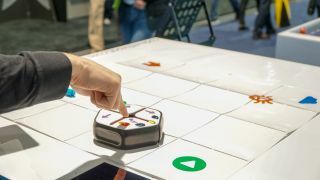 Root appears to be an incredibly feature- and-value-packed toy for kids of, honestly, all ages, and it’s handily the best toy we’ve seen on the CES 2018 show floor. Keep an eye out for this one in early summer 2018 – your kids might thank you for that software engineering career you just dropped in their laps.